While choosing curtains and drapes for your home is an often-thought-about decision, it's easy to forget that the rods they will hang on are also decorative items and will have their own impact on your home decor. Once you have chosen your curtain fabric, choosing the rod is simply a matter of a few considerations. Whether you're modern or traditional, want total darkness or to let the light in, finding a curtain rod is easier than you think. Consider the weight of drapes or curtains you are using in a room when you think about what thickness of drapery rod to use. If you plan on having heavy, black-out drapes in a room, you may consider choosing a rod with a larger diameter (two or three inches). If you're hanging a lightweight material, such as lace, you may want a small, half-inch diameter rod. If you have heavy fabric but want a thin rod, plan for the need of additional support brackets to hold up your curtain. Consider the material of your curtains when choosing a material for your drapery rods. Drapery rods can be made of plastic, different metals or wood. 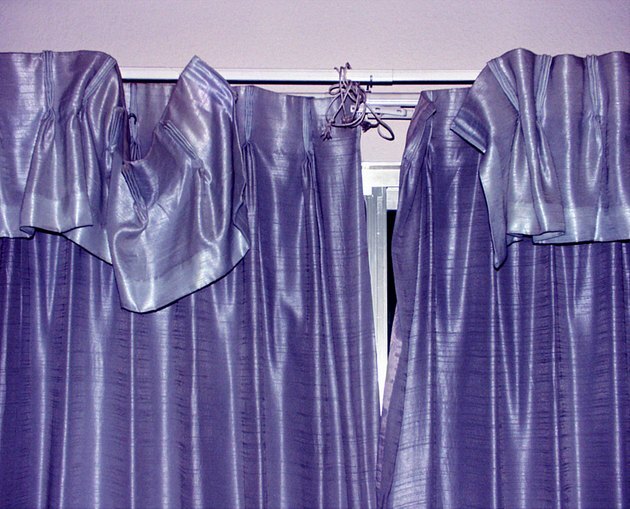 While most of these materials are fine for the everyday usage of most curtains and drapes, if you have curtains in very light, fragile fabric (such as lace, silk or tulle), you may consider a smooth metal or plastic rod over a wood rod, which may split and splinter over time in the sunlight coming through a window. While cafe rods are most susceptible to sun damage, sunlight reflected off light fabric, plastic roman shades or white walls can damage any rod over long periods of time. Choose a color for your drapery rod that matches one of two things: other items in the room or the curtain itself. Usually, you'll want to match your rod to other items in your room. In the kitchen, for example, a stainless steel rod can pair well with stainless steel appliances. Choose a black rod if the furniture in your room is black. If you have light, shear white curtains and don't want to over-power them with a black rod, choose a white plastic rod to match the curtains themselves. Decide whether or not you want a simple, one curtain on one rod look for the room or if you want to do a layering effect to have a choice in a light window shade or heavy covering. If you would like two curtains over your window, choose a rod that will allow for this: a combination rod. A combination rod is basically two rods in one and will allow for two sets of curtains to be hung over the same window. Measure your window area to determine if you have room for a standard curtain rod with decorative ends or if you'll need a cafe rod, one that fits inside of the windowsill (usually in kitchens and nooks). A cafe rod is usually paired with a valance cover, as well, because the curtain on a cafe rod will not cover the top or sides of the actual window (only the window itself). If you'll need a cafe curtain rod, use the same steps above to choose color and material and consider a "bubble shade" curtain to add depth to your window. Look around your room and determine whether your style is more traditional or more modern. Traditional curtain rods are round and fit the curtain on the rod simply by sliding on the curtain. The rod is attached to the wall and other than that, there are no additional attachments or brackets. A modern look may include attaching the curtain with hooks, not unlike a shower curtain setup. For this, the rod doesn't necessarily have to be round. Modern rods can be triangular and have small holes to fit hooks to hang curtains. Choose a rod that will complement the style of the surrounding room and your personal tastes.